Chichen Itza is the remains of an ancient Maya city. The peak of the city was from about 800 AD to 1100 AD, when a large part of the structures were built. The different ruins hold a multitude of architectual styles, from different areas in central Mexico. It is thought that this is because of cultural diffusion, rather then migration or conquest. The site is a popular tourist attraction, and it is visited by hundreds of thousands of tourists every year. Aside from attracting tourists, the structures also hold great archeological interest. Because of this tourists are no longer allowed to climb the monuments, but they are still free to walk around on the site. 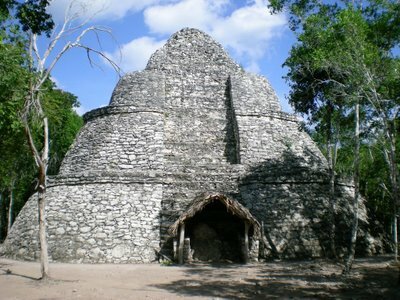 90 kilometers east of the more famous Chichen Itza is the less famous Maya ruins of Coba. At the peak of the city it is estimated to have had around fifty thousand inhabitants. The ruined city date back to the 1st century. Most of the structures were probably built between the 6th and 10th century. At it's pike it most have been a very powerful trade city. There are traces of Teotihuacan architecture and the city was well connected to other towns in the area. 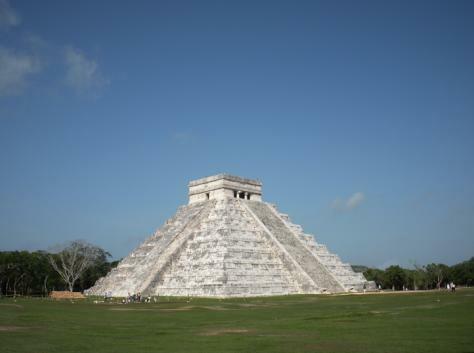 At some point in time, however, it lost most of it's power to Chichen Itza. Today it is gaining a lot of popularity as a tourist attractin. Different from Chichen Itza, it is still possible to climb the ruins, and it has lots of interesting hieroglypic inscriptions.